The Disney Pixar Cars film was released the same year in which Roo was born with a sequel in 2011. With the film already released and loved by many, it was something that we added to our family films collection. Since then both of the Disney Pixar films have been watched time and time again, especially by Tigger. Later this year Disney Pixar Cars 3 is due for release in the cinemas and Tigger has already requested a family day out so that we can enjoy it on the big screen. 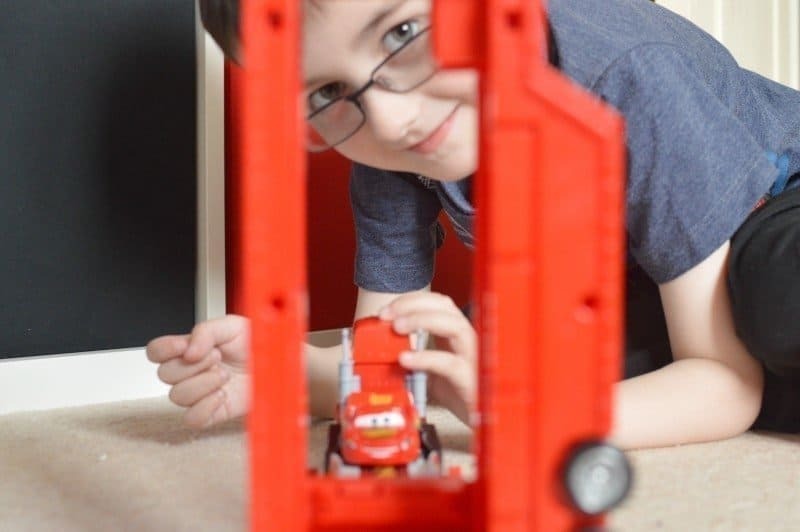 His love of Cars doesn’t end with the films, he has his trusty light up trainers (that helpfully light up the way in the dark), clothing and of course an array of Disney Pixar Cars toys. 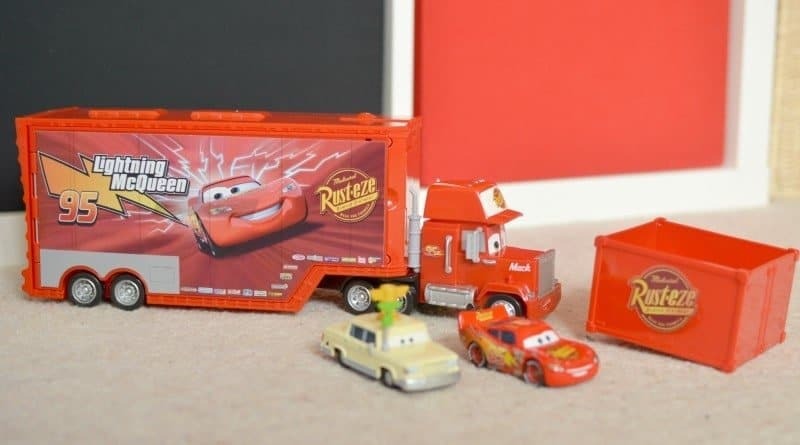 One that he has recently seen advertised on the TV is the Disney Cars Mack Truck, so you can imagine the smile on his face when he found it sitting in his bedroom. Store and play with your Disney Pixar Cars with this cool Transforming Mack Playset (Cars sold separately). With this tower jump, you get two ways to play with Mack as a push around hauler and a stunt training set. Store your favourite Cars characters inside and drive to your next location. Park and practice your stunts with pop and drop action. Although the blurb for the Disney Cars Mack Truck states that it can be used in two ways I actually think that four ways are more accurate. 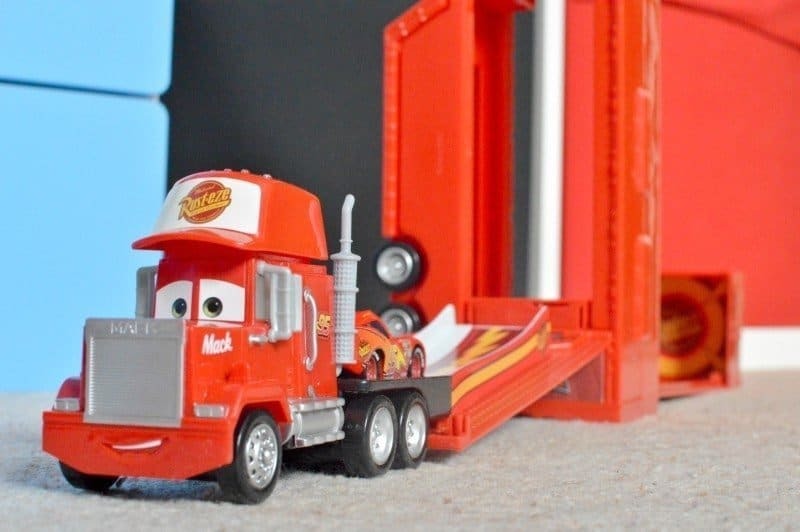 First and foremost it is a Mack Truck, ready to be pulled and pushed around the floor transporting everything that Lightning McQueen needs for his shows. Secondly, he is a car store for the Disney Cars vehicles that interact with the transforming Mack Truck. Although sadly, you don’t get any vehicles included with the playset so you will need to make sure that you have either purchased a new vehicle or that whoever you are buying for already has some Disney Cars vehicles. Thirdly, it is a fast-paced race track, by attaching the Mack Truck cab to the track that folds out of the sides of the truck. Pull back a car until it clicks, before pressing Mack’s cap and watch the car shoot off through the truck over to the waiting Rust-eze 95 box. Lastly, a stunt track that unfolds from the back of Mack’s truck and once standing on it’s end is a stunt track ready to see how far you can get a car to go. As well as trying to land it in the Rust-eze 95 box. Simply load up a car, tip the lever and watch it fly down the track and through the air. Great fun and not too big that you couldn’t take it with you to Nanny’s house or even on holiday to play with in the hotel room. Tigger has been loving the Disney Cars Mack Truck, especially trying out different cars on the tracks to see which one goes the furthest. 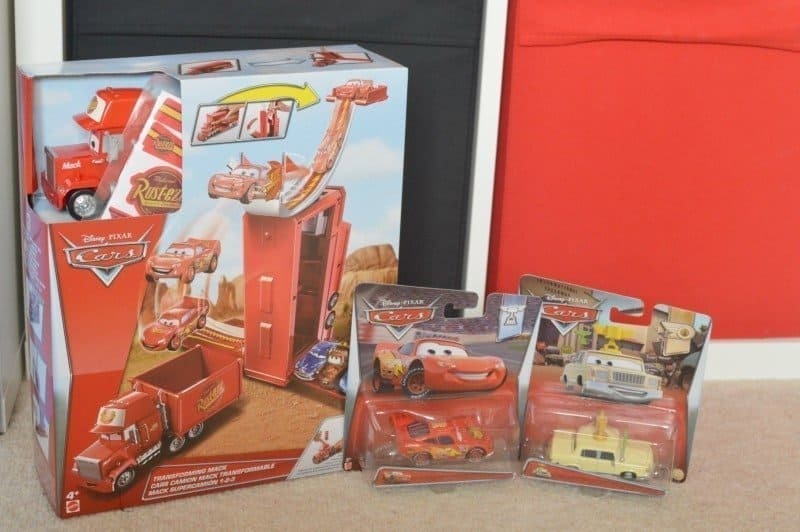 Disclosure: We received a Disney Pixar Cars Transforming Mack Truck and two Disney Cars vehicles FOC for the purpose of review. Previous Post: « We’re #Lalaloopsy Now Streaming on Netflix!